Wow, just wow. This book was awesome. I've read a lot of angel books out there. Most of the time I enjoy them, but they usually don't make as big of an impact as this book did. I'm not sure how to exactly explain it, so please bear with me. 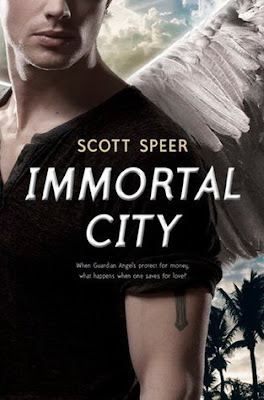 In the very beginning, readers are swept up into an alternate Los Angeles where angels live in luxury and where only the rich people can afford the Guardian angels' assistance. The system of the angels is pretty jacked up and Maddy wants nothing to do with them, neither does she see the wonder to them. Maddy is pretty content living the life that she has. She goes to help her Uncle Kevin at his diner and waitresses, goes to school, and tries her best to blend into society where all they can talk about are the angels, which she does not understand their infatuation. On the other end of this, Jackson, also known as Jacks, is living the dreams. He's extremely talented with his practice to become a Guardian, he's going to become a true Guardian in a week, and he has many girls and women swooning just at the sound of his name. Instantly, I felt as if I could connect to both of them. Jackson wants to prove to Maddy that he can be down to earth and normal, that he's not like the others. Meanwhile, Maddy doesn't want much to do with him. Both of their ideas and thoughts were understandable. But this just isn't about a forbidden romance between an angel and an average human girl. Oh, it is much more than that. There's mystery and imminent danger. Surprisingly, things got pretty dark, too. It definitely wasn't something I was expecting from this book. There was action and everything I could ever wish for from a book. Although this book did not make me cry or anything, I felt emotions. I would turn the pages wildly, gulping up all of the words, my breath would become short all because I felt Things. It was great. I liked how the POV would change. It wasn't a rough transition since it was in third person. I enjoyed the moments where I would be in Maddy's mind and then travel into Jackson's. There was also a third mind I read into, but I won't say much about him because he's part of the mystery, other than he's a detective dude. They were flawless transitions between the POVs and they always left me impatient because there were the occasional mini cliff hangers. In all, I was super happy about this book. I pounced at the opportunity to read it when I saw it at my local library. This book received five out of five stars from me because it was just so great. I hope that everyone will get a chance to read this, not only angel fans or the romance, but for the readers in between. It was one that I'm sure many people will enjoy. I can't wait to read the next installment for this book! First Ever Book Haul Vlog!